Looking for a fall elementary music lesson, speech and activity to use in November around Thanksgiving? 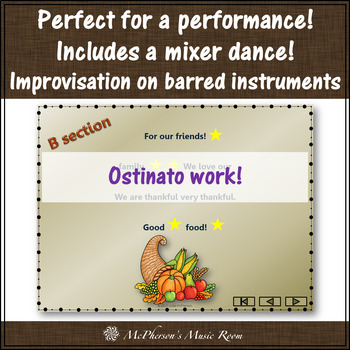 Would you like for it to include reading/reviewing/reinforcing rhythm, form, instruments, ostinatos, and a mixer dance? This music activity and original speech ensemble will be a perfect addition to your Orff lessons and Kodaly lessons! 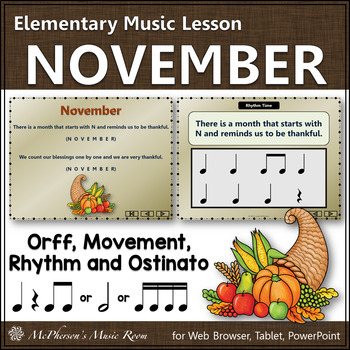 Teach your first – third graders how to spell “November” while addressing your music curriculum. •	5 detailed lessons each 5-10 minutes (6 pdf pages) and an original composition/score. 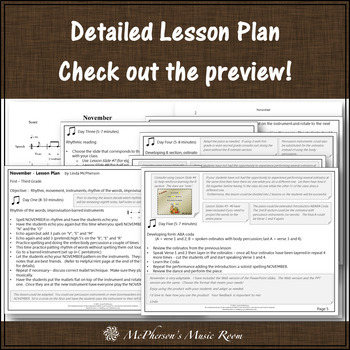 The lesson plans include instructions for teaching the speech ensemble and activities to 1st – 3rd grade. Adaptions and extensions are also addressed. •	7 Lesson Slides to be used in conjunction with the lessons. The slides were created using PowerPoint 2010 with 3 slides being interactive. 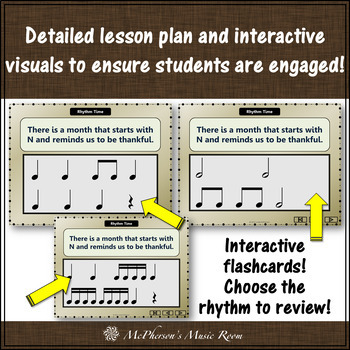 There are 3 different rhythmic combinations to choose from in the lesson plan slides so you can continue working on the rhythmic combinations you are currently addressing: eighth notes, half notes or sixteenth notes. Each rhythmic slide has 6 animated rhythms on it. The PowerPoint slides work well with a Smartboard – just touch the board.